Greetings Vintage Drum Fans! Thank you for taking the time to read these articles by myself and all the other great writers here at Not So Modern Drummer. 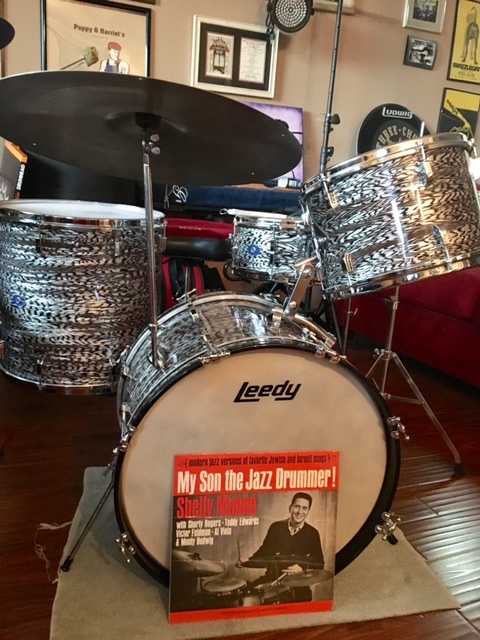 This month’s Vintage Happiness article is on another Leedy set in my collection that I acquired in 2017. I am a big fan of the art deco lugs and T-rods from this era when Slingerland owned Leedy and manufactured these drums as well as Slingerlands from 1956 through what appears to be Oct 1966. This is a 1966 Leedy Shelly Manne Outfit No. 11 in Grey Agate Pearl. This set is date stamped Oct 66 in the drums. I was previously under the impression from my readings and learning that Leedy drum production ended in 1965. This kit apparently didn’t get the memo. The set consists of a 14x20 bass drum, 9x13 tom, 16x16 floor tom, and the fantastic 5.5x14 Shelly Manne snare with the Broadway throw off. 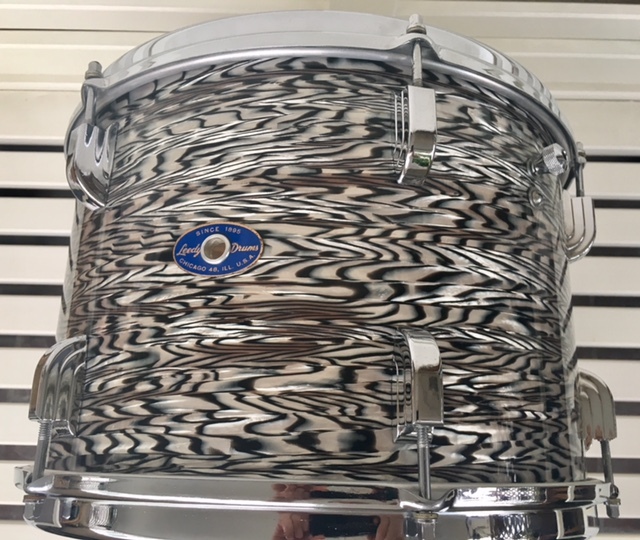 The drums also have the “chocolate milk” interiors, which is consistent with Slingerland manufacturing. The entire kit is in almost showroom condition. There is no rust on any of the metal and there is no fade on the wrap. Lugs were taken off to compare the colors and there was no difference. This is another great example of a well cared for drum set. This combination of sizes also is a favorite of mine making the kit very versatile for the different size venues and music I play. A truly welcome addition to the collection and into the rotation this kit goes. I’ll be featuring more Leedy drums in the coming months so stay tuned for more time machines because nothings cooler than time traveling on a set of vintage drums.